Find out what hot topics ecologists and physiologists are jazzed up about. Sort by completed research to read posts focused on answering specific hypotheses or by ongoing research to read tidbits from graduate student research. Don't go into the long grass! These disastrous and comical field & lab chronicles guarantee amusement. Scientists collect their data according to a detailed plan. To our dismay, the universe often has alternative and conflicting plans that put us in unexpected situations. Scientists, automated robots, and mini-backpacks equipped with tiny QR codes team up to finally understand how pesticides harm the lives of bees. Read the full scientific article here and check out the lead author’s, James Crall’s, website for details and more awesome video. Neonicotinoid pesticides are widely used to protect our crops from insect pests, but neonicotinoids don’t discriminate, as they also target beneficial insects like pollinating bees. This class of pesticides disrupts an animal’s nervous system affecting their behaviors and physiology. USDA estimated annual imidacloprid use in the US for 2016. The neonicotinoid imidacloprid is applied to an estimated 1 million pounds of vegetables, fruit, and soy annually in the US, and the pesticide can remain in plant tissue for up to 230 days after application. USDA estimated annual imidacloprid use by crop in the US, 2016. Celebrate in that the total estimated annual imidacloprid use has decreased by 1 million pounds of food in recent years. Harvard scientists developed an automated robot to continuously track the behavior of bees to characterize the negative effects of eating ecologically relevant levels of imidacloprid (levels of imidacloprid that they would encounter in the wild). Specifically, researchers determined that consuming this pesticide harmed bee behavior and the colony’s ability to regulate their nest temperature. 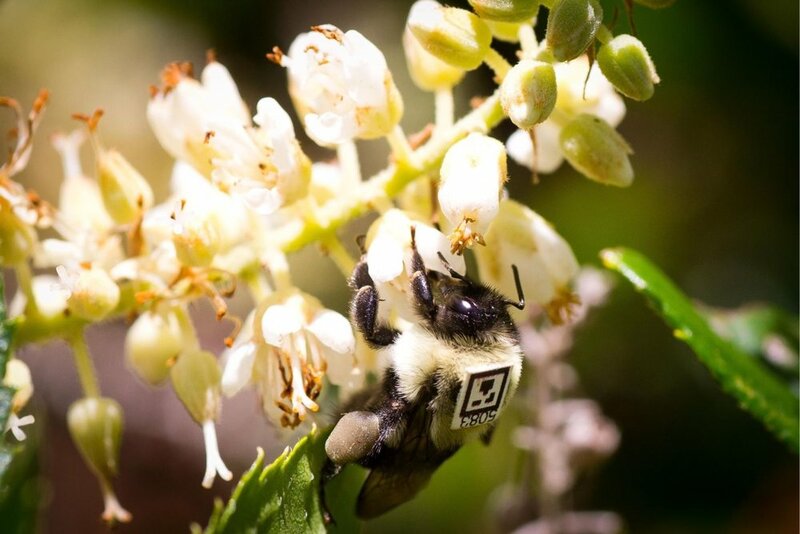 Tracking data gathered by the robot revealed that eating imidacloprid impaired normal bee behavior after both a single exposure and repeated exposure to the pesticide. Example using the BEEtag software (https://github.com/jamescrall/BEEtag) to track individual bumblebees 24 hours after consuming 0.1 ng (blue) or 1.0 ng (red) of imidacloprid, or a control sucrose solution (green). Bees that consumed daily doses of imidacloprid and bees that ate one single dose of imidacloprid both decreased the amount of time they spent active, the time they spent nursing, and the proportion of time they interacted with other bees compared to bees eating normal nectar. Bees eating imidacloprid also spend more time on the outside of the colony away from the food storage hub and nursery. An experiment set in the field with natural conditions revealed that bee physiology is also harmed by short term pesticide consumption. Bee colonies weren’t able to regulate their nest’s temperature after 1-2 hours of intermittent feeding on nectar containing imidacloprid. Whereas, colonies feeding on normal nectar maintained nest temperatures above outdoor temperatures. Crall et al. 2018, Figure 3 C. Brood versus outdoor temperatures for control, normal nectar fed colonies (C, green) and treated, imidacloprid fed (IM, red). Transparent markers show individual measurements across all colonies, and solid lines show LOESS-smoothed trends by treatment. These elegant series of experiments present new automated technology that enables scientists to answer detailed questions about context specific insect behavior, movement, and social dynamics. The future possibilities are endless: How will bees respond to other pesticides, contaminates, or disease? How do these challenges affect other insect species? How do different insect species socially interact? But also as a take-home message: don’t use or support neonicotinoid pesticides. What did you think? Please provide us with feedback by answering this short survey! “Flapping in a winter wonderland”, slightly alter the lyrics to Richard B. Smith’s Winter Wonderland and now we’re talking sea ducks. If you’ve had the pleasure to be on a boat off the shores of New England in the not-so-balmy winter months then you have probably gazed upon rafts comprised of thousands of sea ducks bobbing in the waves. These ducks inhabit our coasts during the winter to take advantage of plentiful food sources while their more northern breeding areas are covered in ice, but just where do these birds go during the rest of the year and what routes do they take to get there? Dustin Meattey, a recently graduated masters student from the University of Rhode Island, partnered with three other wildlife agencies to answer that very question. Sea ducks are some of the most prized waterfowl species for duck hunters, wildlife photographers, and birders. The coastal waters and offshore environments in southern New England provide crucial winter habitat for several species including Common Eiders, all three species of scoters (Black, White-winged, Surf), and Long-tailed Ducks. Over the past several decades, population declines of many sea duck species have highlighted the need for a better understanding of their habitat preferences, migration patterns and timing, and linkages between important geographic areas throughout their life cycle. Reasons for these declines remain poorly understood, but habitat conditions and disturbance on the wintering grounds may have carry-over effects impacting annual survival and breeding productivity during subsequent seasons. Because sea ducks spend much of their annual cycle in non-breeding areas where human-induced threats are often greatest, understanding habitat use on their wintering grounds is crucial for conservation planning. As the development of offshore wind power moves closer to large-scale implementation in the northeastern United States, particularly in areas used by sea ducks during winter, identifying important habitats used by wintering sea ducks informs the planning process and helps avoid displacement of sea ducks from preferred habitats. One species of sea duck that inhabits New England coastal waters during the wintering period is the White-winged Scoter (Melanitta fusca). White-winged Scoters are a long-lived sea duck species that winters along both the Atlantic and Pacific coasts of North America, with increasing numbers also wintering on the Great Lakes. White-winged Scoters nest throughout the interior boreal forest from Alaska to central Canada, with geographically separate eastern and western populations, although some studies have suggested that birds from Atlantic and Pacific coasts may overlap on the breeding grounds. Like most other sea duck species, White-winged Scoters have apparently experienced a long-term population decline throughout the last half-century. Researchers from Rhode Island Department of Environmental Management (DEM), University of Rhode Island, Biodiversity Research Institute, and the Canadian Wildlife Service partnered together between 2015 and 2018 to study the movement ecology of White-winged Scoters. We deployed over 50 satellite transmitters in adult females on their wintering grounds in southern New England and at a molting area in the St. Lawrence River Estuary in Quebec. We were able to follow the movements of many individuals for over two years, as they traversed thousands of miles between wintering areas on the East Coast to breeding grounds across the northern boreal forest from Quebec to the Northwest Territories of Canada, on their return migration to important molting and then wintering areas, and for some back again to the breeding grounds. The data gathered from these birds allowed us to calculate the size and habitat characteristics of winter home ranges, and to identify specific areas in southern New England during winter that were preferred by White-winged Scoters (Fig. 1). Our results suggested that offshore sites predicted to be most used by scoters had minimal overlap with currently leased and proposed wind energy areas in southern New England (shown in blue). However, many birds made long-distance flights throughout the winter between areas like Montauk Point, NY and the Nantucket Shoals south of Nantucket Island, therefore they were likely often crossing wind energy areas as they moved between their preferred sites. This suggests that future wind energy development in the currently proposed lease areas could act as a deterrent or barrier to these important within-winter movements. Movements by satellite-tagged adult female White-winged Scoters in fall from breeding sites to molting and wintering locations. Movements by satellite-tagged adult female White-winged Scoters in spring from wintering sites to breeding locations. Using the movement data from these scoters, we were also able to identify and document their primary migration routes between breeding and wintering areas and the timing of these movements (Figs. 2, 3). 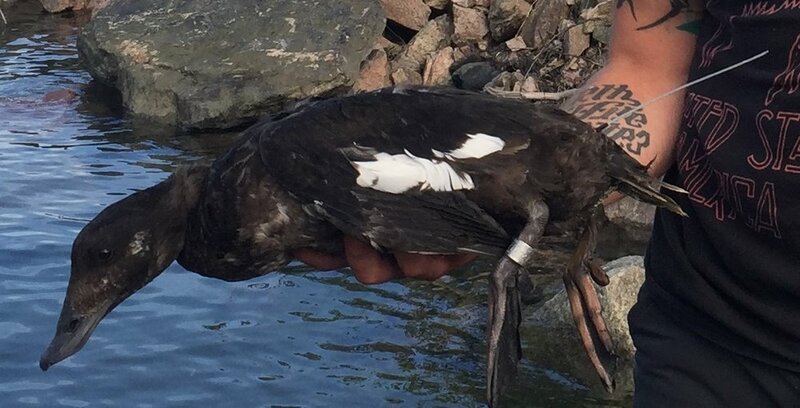 This information is important for biologists responsible for designating hunting seasons and for protecting key areas used during migration, and for others responsible for managing offshore wind farms and other potential sources of disturbance. White-winged Scoters wintering in coastal New England bred throughout northern Canada from northern Quebec to the Northwest Territories. After leaving the breeding grounds, scoters underwent a month-long wing molt primarily in James Bay and the St. Lawrence River Estuary before continuing their fall migration back to their primary wintering grounds in southern New England. An important finding from this research was that migration timing was consistent among all birds in our study, regardless of where they bred or molted, and regardless of what route they decided to take. Essentially, the eastern portion of the continental White-winged Scoter population seems to function as a single, continuous population with little evidence of any geographically distinct sub-populations. This suggests that our current harvest of White-winged Scoters should not disproportionately target any particular segment of the population. Our hope is that this project provides helpful information to policy makers, developers, and biologists to best conserve and manage this important species. This study was part of the Atlantic and Great Lakes Sea Duck Migration Study, a multi-partner collaborative project initiated by the Sea Duck Joint Venture. Dustin Meattey studied Spatial ecology of sea ducks in the Scott McWilliams lab at the University of Rhode Island and is currently a wildlife biologist with Biodiversity Research Institute.